A computer program developed at Case Western Reserve University outperformed physicians two-to-one in a study that identified abnormal tissues in MR scans of the brain. MR scans of brain cells that were killed by radiation can look very similar to recurring brain cancer, and brain biopsies are the only definitive test to know for sure — but brain biopsies are very invasive and risky. The researchers developed the program to perform brain cancer diagnoses utilizing machine learning algorithms and radiomics, which are features extracted from images using algorithms. "What these radiomic features capture are the subtle differences in quantitative measurements of tumor heterogeneity and breakdown in microarchitecture on MR, which are higher for tumor recurrence," Pallavi Tiwari, assistant professor of biomedical engineering at Case Western Reserve and leader of the study, told HCB News. "Given that brain tumors are highly heterogeneous and disordered, we observe a high value of entropy measurements in tumor recurrence as compared to radiation necrosis," she said. 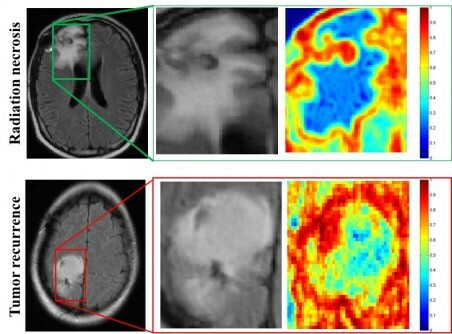 In the study, 15 scans were analyzed by the computer program and two physicians. The physicians were correct in seven and eight of the 15 patients, respectively, while the computer program was correct in 12. In addition, according to Tiwari, the physicians took between 10 to 15 minutes per patient and the computer took less than a minute. The images above are MR scans of patients with radiation necrosis and cancer recurrence. The middle column shows that the tissue is indistinguishable, and the right column shows that the upper right scan has less heterogeneity (blue) and the lower right corner has much higher heterogeneity (red). The researchers don't expect the computer program to be used on its own but as an aid in assisting neuroradiologists become more sure when identifying a suspicious lesion as radiation necrosis or cancer recurrence. They said that quick identification can help speed prognosis and eliminate costly and risky brain biopsies to ultimately improve patient outcomes. "Once evaluated on a larger cohort of studies, our algorithms can potentially be integrated in the current clinical workflow without the need for advanced imaging such as PET, and magnetic resonance spectroscopy, which are not readily available at most clinics, including community hospitals, and low- to medium-income countries," said Tiwari.